Cyclosporine (also known as ciclosproin) is an immunosuppressant drug. It specifically inhibits T-lymphocytes, a type of immune cell that functions to stimulate and organize an immune response. A person’s immune system normally functions to protect the body from infection and cancer. However, when the immune system malfunctions it can attack the body instead of protecting it, resulting in autoimmune conditions such as psoriasis, rheumatoid arthritis, and hashimoto’s thyroiditis. 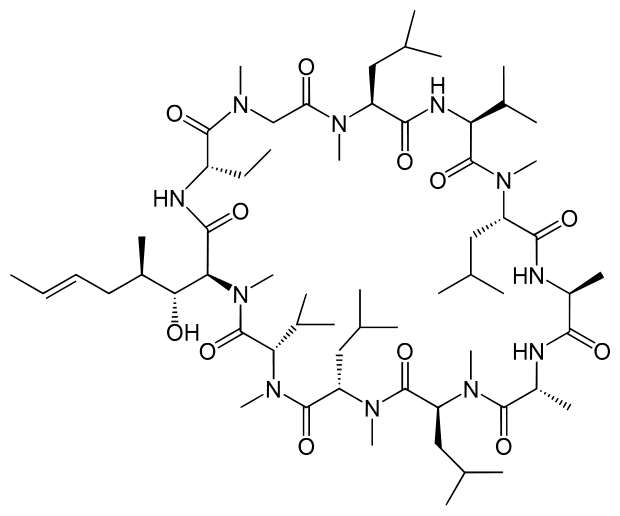 Cycosporine is used in many patients afflicted with such diseases in attempt to tone down this aberrant immune response. It is also used to suppress the immune system in organ transplant patient. In these individuals their immune system correctly recognizes a transplanted organ (such as a kidney or heart) as foreign and mounts an immune attack on it. In this case the immune system is acting normally but is still putting the patient in danger. Thus, cyclosporine and other immunosuppressing drugs are used to prevent transplant rejection. Cyclosporine is not a perfect drug, however. It comes with its own set of side effects and must be used with caution and care. One such side effect is unavoidable – if the immune system is suppressed the body is more susceptible to infection and causes an increased risk for certain cancers such as lymphoma. Cyclosporine should not be used by pregnant women. This long list of side effects may seem daunting, but in reality most patients never experience them, especially at the low doses that are usually used. If side effects do occur it is usually one or two, not the full list. Many of these side effects only appear with initial use of the drug and vanish after repeat usage. However, it is true that sometimes these side effects limit the use of this drug. It is because of these potential side effects that cyclosporine must be prescribed by an experienced physician. Another caveat to the use of cyclosporine is that it can interact with other drugs which either increase or decrease its efficacy – both of which should be avoided. For this reason a person using cyclosporine should inform all new healthcare providers (including primary care doctors, dentists, and pharmacists) that they are using it, should not use any new medication (including over the counter drugs that do not require a prescription), and should avoid eating grapefruits. Furthermore, those on cyclosporine should have regular appointments with their physician to monitor for side effects and to track how effectively the drug is working. Cyclosporine is a safe and effective drug when used correctly. There may be some barriers to its use but it is very effective in treating autoimmune conditions such as psoriasis. Contact your physician for evaluation if you feel that you may be a candidate for cyclosporine.